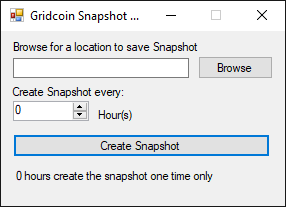 Today, I wrote a new tool that aims to create Gridcoin Snapshots automatically. The tool is very easy to use. Just specify the filename for the snapshot and press the "Create Snapshot" button. You can also specify the amount of hours to automate this process for you. It will first close the wallet properly to prevent corruption. Once the compression is finished, it will launch the wallet again. The requisites to use this tool is to have 7zip installed in the default location at C:\Program Files\7-zip. Bitshares BOINC project brainstorming thread! All ideas welcome! 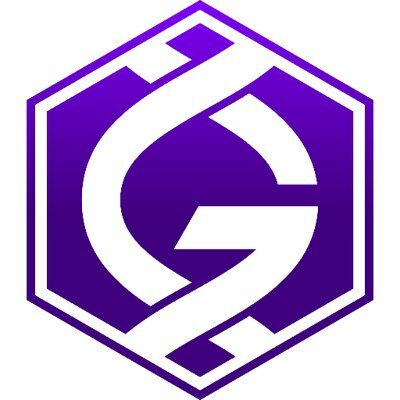 I'm Customminer from the Gridcoin https://gridcoin.us community, I've been a holder of BTS since BTSX days & have a very positive outlook on the future of Bitshares! believe that the BOINC & Gridcoin community can help! active users (differing estimates depending on what site you go to..
projects (project owners pay nothing). I spoke during episode 200 of the BeyondBitcoin hangout https://soundcloud.com/beyond-bitcoin-hangouts/beyondbitcoin-spotlight-gridcoin-03-24-17 and the 14th Bitshares hangout Chris4210[/member]/bitshares-hangout-14-03-31-17]https://steemit.com/bitshares/@Chris4210/bitshares-hangout-14-03-31-17 on this topic. the world via a BOINC project? field to the BOINC signup page and user profile. on their full node availability/capacity/consumed-resources). Since full-nodes are always required, this would make a Bitshares BOINC project eligible for Gridcoin whitelisting. everyone would be able to participate unlike the load generator. You could distribute TensorFlow https://www.tensorflow.org/ docker containers, and perform machine learning against data gathered from the BTS DEX. in an automated manner to evaluate optimal quantities of witnesses. distribute rewards to your volunteers). power? Please post your ideas in this thread! Resolve syncing problem with beacon business logic. New video by the Gridcoin channel, demonstrating how to set up the grcpool.com to work with the BOINC project manager to earn Gridcoin via pool research. Use your BOINC science research to earn yourself some Gridcoin and then trade for some Bitcoin, buy stuff with coinpayments or HODL and profit long term. Visit & subscribe to https://www.youtube.com/channel/UC7HniwuUMx4EXlB2OXG89BA/videos for more gridcoin related videos. Please tell us when you experience problems! Fix incorrect V8 height trigger check. Fix invalid superblock height formatting, #532 (@denravonska). Fix several spelling mistakes, 533 (@Erkan-Yilmaz). Fix problems forging superblock due to rounding differences, #608 (@denravonska). Fetch data from project servers if missing on scraper #564 (@denravonska). Fixed Fix problems sending beacons on Windows, #684 (@tomasbrod). Fix clients getting stuck at V8 blocks when syncing, #686 (@tomasbrod). For those Gridcoin users who still don't know (I discovered it several days ago) that new Gridcoin Wallet for Mac is available! I like it much better than PC version, also I'll keep it most of the time Online on my Mac laptop (to help the system and later for staking) and will use for transactions, as I work mostly on Mac laptop. When you donwload it, it will take you several days to process transaction history, i.e. 2 days ago when I downloaded it, it was 1000+ days behind. 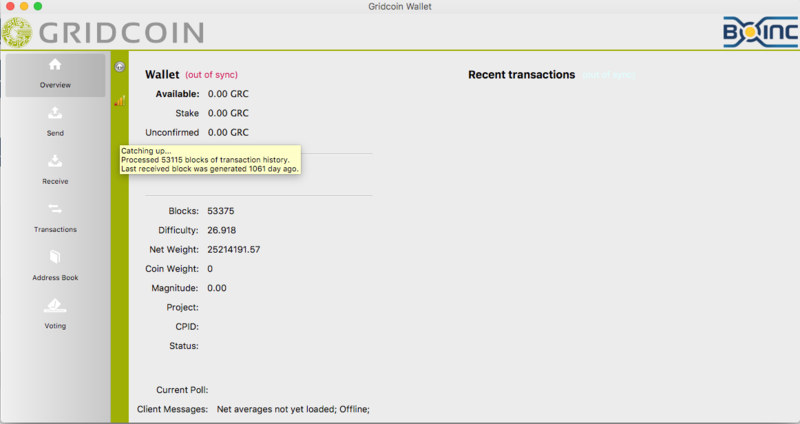 Right now when I'm writing this, I have 147 days left (of transactions which are needed to be processed), so soon, in several hours I'll have wallet up to date, and even will receive some GRC which I claimed from Faucet to have something on my new wallet. - Properly fix for wallet not daemonizing, #822 (@denravonska). Step 1. Do a Gridcoin wallet and save wallet.dar and the .conf file on an external usb. Step 2. Do an account on grcpool website. Setup up everything including your wallet address. Time for an update on where we stand with the white paper. We haven't made any changes to the white paper over the past few weeks, but if you still have ideas please let us know! The current version is 1.0.2. The poll is currently running at ~18.1% vote-weight participation with ~99.35% approval. We could not be happier with both the participation level and the support for our work. Thank you! The poll continues until April 20th, so do vote if you haven't. 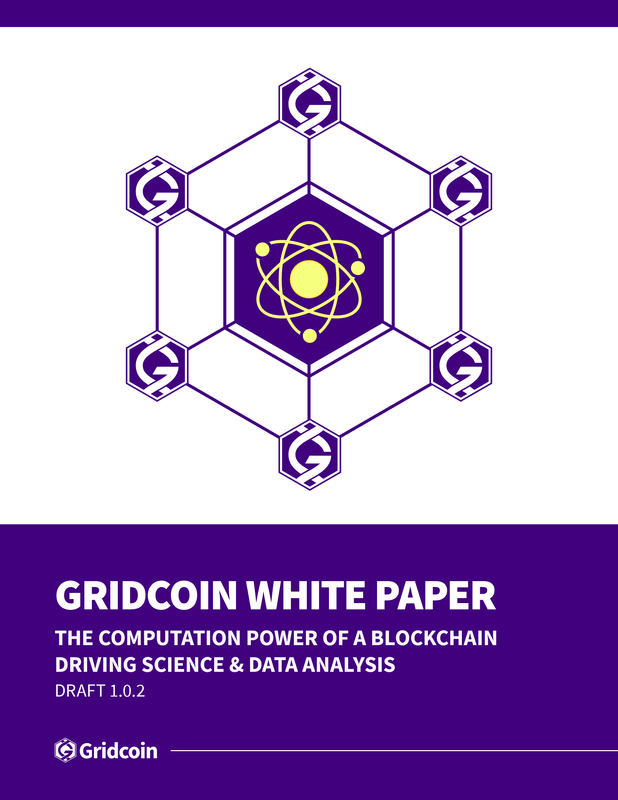 I'm going to go ahead and assume that the poll will close with approval and the proposed white paper will be adopted as the official Gridcoin white paper. First, we will need to work out how to host the document on the gridcoin.us website. Next, we will need to reach out to exchanges with the hope of getting listed. It might also be time to start planning some larger (though still very focused) marketing and outreach initiatives -- we have a document, let's use it! We need help! If you have experience with marketing, technical writing, outreach, project management, or if you have some ideas you want to toss around or want to get involved in any way, join us on slack or on discord and let us know what you want to do. Reach out for an invite to slack. It's wonderful seeing all the great things the community is working on. Keep it up!